The Middle Ages encompass one of the most exciting periods in English History. 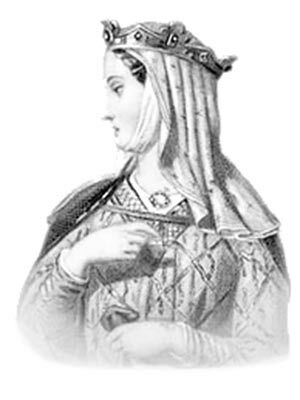 The names of famous Medieval women scatter the History books - they were mostly queens and princesses. But what about the women who were not of noble birth? Who were these Medieval women who became famous despite the dominance of men during this era? The following biography information provides basic facts and information about the key dates and events in the life of Jane Shore who was famous as the beautiful mistress of King Edward IV of England. Married: Jane Lambert married a goldsmith called Lambert Shore. The marriage was annulled due to his impotence. Character of Jane Shore: Jane was described by her lover, King Edward IV as " Merry in company, ready and quick of answer.". She was witty, literate, cheerful, intelligent and warmhearted. Why Jane Shore was famous: Jane Shore became the mistress of King Edward IV during the period in England referred to as the Wars of the Roses. After the king's death she became the mistress ofThomas Grey, 1st Marquess of Dorset and then Lord Hastings. When King Richard III came to the throne Jane Shore was accused of Sorcery and Witchcraft and forced to make a humiliating and public penance as a harlot. The story and biography of Jane Shore which contains interesting information, facts & the history about the life of this Medieval woman of historical importance. Jane Shore was born as Elizabeth Shore. She was born in London and was the daughter of a wealthy merchant called John Lambert. Jane was a lovely child who grew into a beautiful woman. When she was still young her father arranged a marriage for Jane to a goldsmith named William Shore. It is believed that William Shore was impotent and the marriage was eventually annulled on these grounds in 1476. According to Sir Thomas More, in his History of Richard III, she was married "ere she were well ripe" to a merchant "an honest citizen, young and godly and of good substance", named William Shore, but "she not very fervently loved" her husband who was "frigid and impotent". The marriage was over, long before 1476. Her beauty brought much attention in London and the notorious womaniser King Edward IV arranged to meet Jane Shore. Her marriage was over and Jane fell in love with the handsome King and became his mistress. Jane Shore was the mistress of the king by 1476. An entry on the Patent Rolls for December 4, 1476 bestowed the King's protection upon "William Shore, citizen of London, and his servants, with all his lands, goods and possessions in England and elsewhere". The marriage annulment followed shortly after this date. Despite his womanising King Edward maintained his relationship with Jane Shore until his death in 1483. Jane was described by her lover, King Edward IV as " Merry in company, ready and quick of answer". Jane and King Edward were lovers during the period in English history called the Wars of the Roses. The wife of King Edward, Elizabeth Woodville, accepted Jane Shore as her husband's mistress. It is possible that the change of name from Elizabeth to Jane was made in deference to the Queen. Jane Shore was a highly visible member of the court of King Edward. She would have mixed with all the important people of the era and friends of the King. The accusations against Jane Shore were reduced to being a harlot - they could not prove the charge of sorcery and witchcraft. The Bishop of London sentenced her to the traditional public penance for harlotry at St. Paul’s Cathedral. Jane, dressed in only her kirtle (petticoat) and in an unkempt state had to walk barefoot along the sharp flint stones of London. She carried a taper and walked in front of the cross and a choir singing psalms. Jane Shore was watched and surrounded by great ogling crowds. She bore this punishment with great dignity. Following her public penance Jane Shore was incarcerated at Ludgate prison for her crime. Her great beauty attracted the king's solicitor, Thomas Lynom. Thomas Lynom entered into a contract of marriage with Jane Shore whilst she was still a prisoner in Ludgate. King Richard III pardoned Jane Shore, apparently at the request of William Lynom. Some say that Jane Shore died in poverty however, this is highly improbable. She was married to a wealthy man. And Sir Thomas More, who knew Jane Shore at the end of her long life, described her as ‘a soft, tender heart’. ‘Yet,' he continued, 'me delighted not so much in her beauty as in her pleasant behaviour’. Jane Shore died in 1527 at the age of eighty two. What a life Jane Shore had led. Jane Shore was buried in Hinxworth Church, Hertfordshire, England. Some interesting facts and short biography information about the History, Life & Times of Jane Shore. Additional details, facts, history and information about the famous people of the Middle Ages and important events during their times can be accessed via the Middle Ages Sitemap.